‘Collage! 2017’ premiered Friday, March 3, at 7:30 p.m. at the Shea Center for Performing Arts. This midterm showcase of the William Paterson music department’s talent is a fundraiser with 100% of ticket sale funds devoted to building scholarships. Lights illuminated the stage to reveal the University Brass Choir. The dapper bow-tied gentlemen and black dressed ladies exuded class. Their opening piece was powerful, incorporating brass and percussion instruments for an energetic and roaring start to the evening. Act I gave the audience samples of saxophone, flute and voice ensembles, even blending in an opera performance. 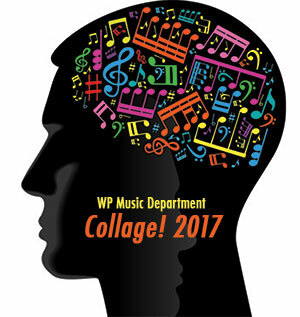 Clearly illustrating the name of the show, ‘Collage! 2017’, kept the audience on the edge of their seats with dynamic changes of performance space (aisles, mezzanine and stage) and swift transitions. The middle of act I featured the talents of the enthusiastic percussion ensemble conducted by the Payton MacDonald. This medley of drum-set, tympani, chimes, cowbell(!) and many other percussion instruments made a high energy and soulful performance. It was followed by whistling and cheering, two audience members offered a standing ovation. “Rosanna” originally by Toto, closed act I on a rock note. This excerpt from ‘I Want My ‘80s: The Best of MTV’s Early Years Band’ a tribute show coming to Shea Center March 24, brought the audience back in time. Students in 1980s fashion actively performed with electric guitars, trumpets, saxophone, two students lent their voices and Rob Fusari was featured on the keyboard. Kristina Rigamonti, a soloist and choir member commented after the show. “One thing I really enjoyed about tonight was the chance to perform with the ‘I want my ’80s best of MTV’s Early Years’ band. It was really fun and it’s going to be an even better show,” Rigamonti said. During intermission, May, a graduate student for Professional Counseling, working as an usher, commented that ‘Collage! 2017’ lives up to the name. Act II opened on the Chamber Wind Ensemble, followed by the concert choir and jazz orchestra performing separately, then together. Saxophones, trumpets and drums lent themselves to the audience’s mental image of velvet couches and cigar smoke in the jazz orchestra’s piece. These performers depicted strong talent, finding a perfect balance of entertainment and quality performance. Phil Collin’s “Take Me Home” closed the show in a big, unifying way. 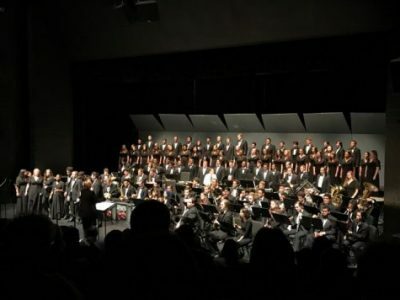 Choir and band members were met with an explosion of applause, ending with a full standing ovation. The music department hosts many artists throughout the year as well as student performances. For details about upcoming events visit the Shea Center, or the music department’s website to check out their event calendar.